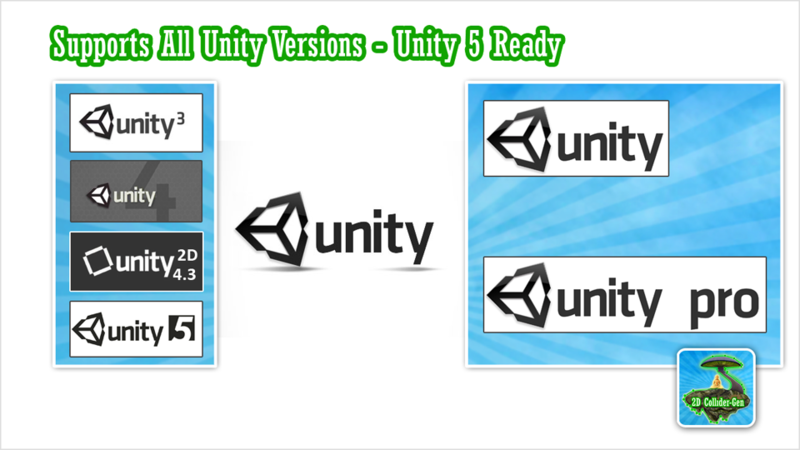 NEW: Unity5 and IL2CPP/iOS-64BIT support. 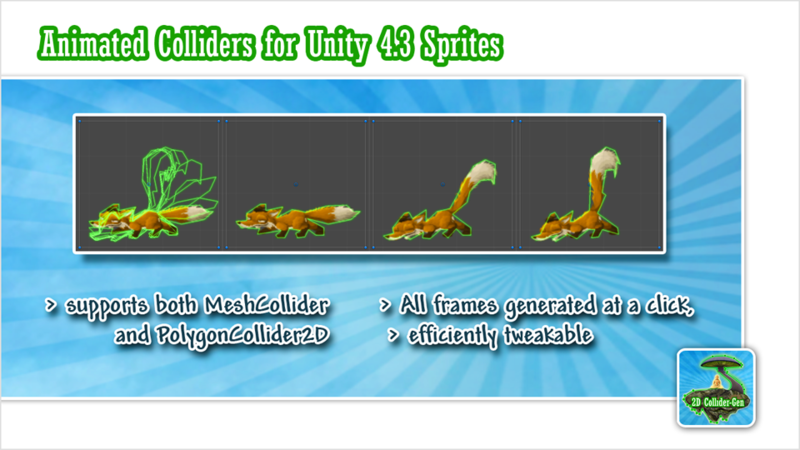 Animated Colliders for Unity 4.3 Sprite Animations. 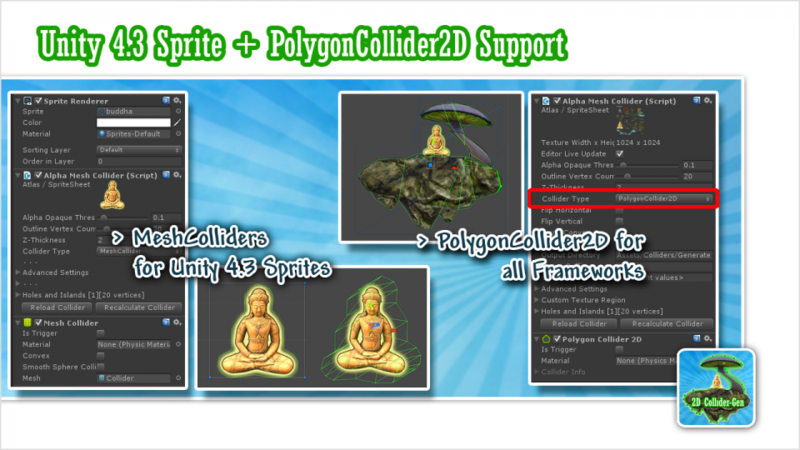 Support for Unity 4.3 Sprites and PolygonCollider2D. Supports Windows Phone 8 target platform. Supports infinite holes and islands within a single image. 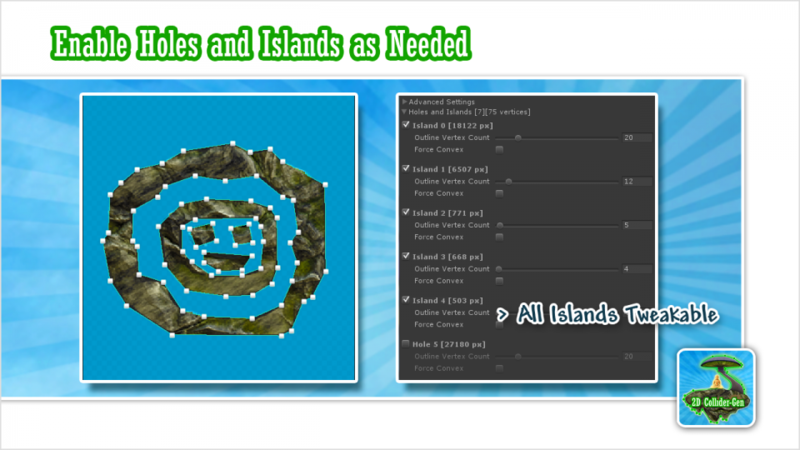 Integrates with SmoothMoves, 2D Toolkit and Orthello (Free, Elements and Pro). Simple parameters for optimal results – specify the vertex count you want. 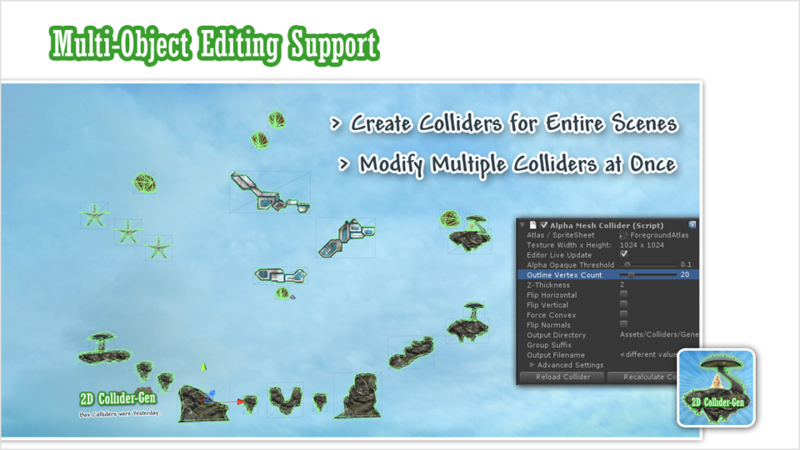 Adds no additional performance cost at runtime – colliders are created entirely within the editor. Colliders can be forced convex for MeshCollider Rigidbody collisions. 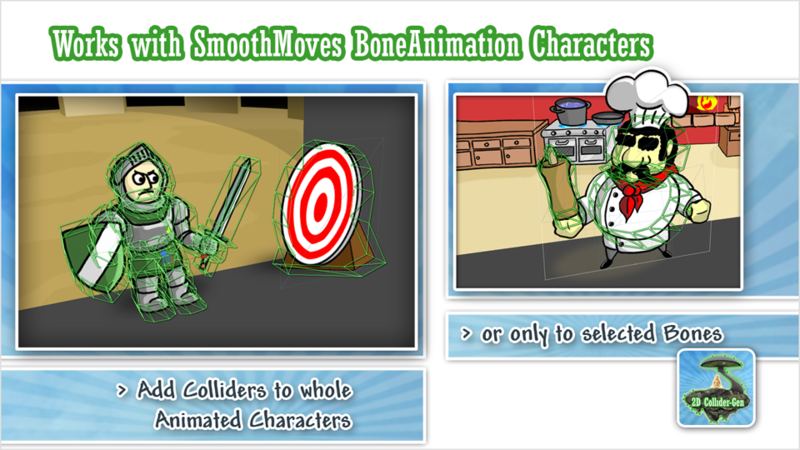 Even works with SmoothMoves BoneAnimation characters. Works with Unity 3.x, 4.x and 5.x – Standard and Pro. Supports all versions of Unity – no requirement for Unity Pro. 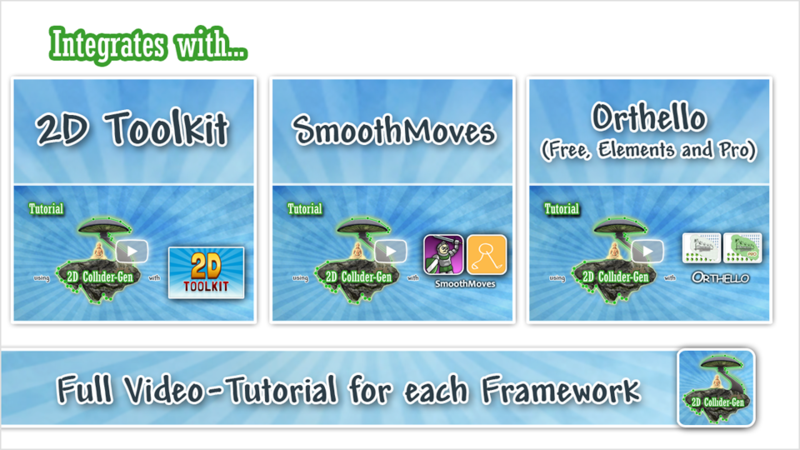 Visit the documentation pages and watch the full video tutorials for each of the officially supported 2D frameworks – 2D Toolkit, SmoothMoves and Orthello. Links to the websites of the great 2D packages we officially support. 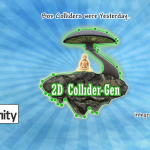 Q I just updated, where did the 2D ColliderGen menu go? A It’s now under Component – 2D ColliderGen. 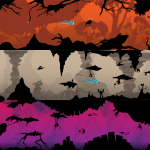 Q Does 2D ColliderGen work with other 2D frameworks? A Yes – just attach an AlphaMeshCollider to your object. Then by default, the main texture of the object is used. If your GameObject has no texture attached, or in case of a texture atlas, you may need to set the Advanced Settings – Custom Texture parameter to provide the desired texture. Please visit this documentation page for further info. Q Does 2D ColliderGen have any impact on the game’s framerate? A No – it does nothing but add a MeshCollider or PolygonCollider2D. Be sure to use the outline vertex count parameter of the AlphaMeshCollider to optimize the vertex count according to your shape – the fewer vertices, the better. Q Can I use 2D ColliderGen to update colliders during runtime? What if I can’t precompute them? 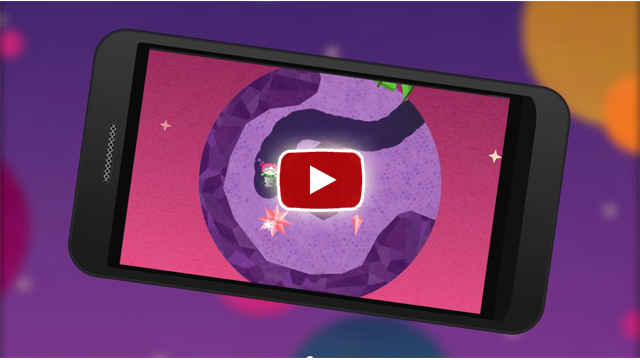 A Yes – Unity4.3 Sprite Animations are supported out of the box. If you can’t precompute them, the answer is still yes, but there is some coding involved for now. 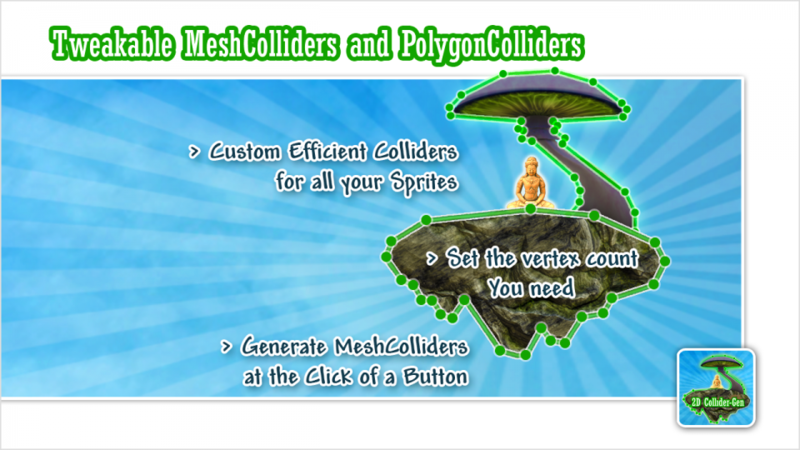 Q There are no front- and back-caps on the MeshCollider, but I need them – what can I do? The easy way is to switch the AlphaMeshCollider output collider type to PolygonCollider2D. 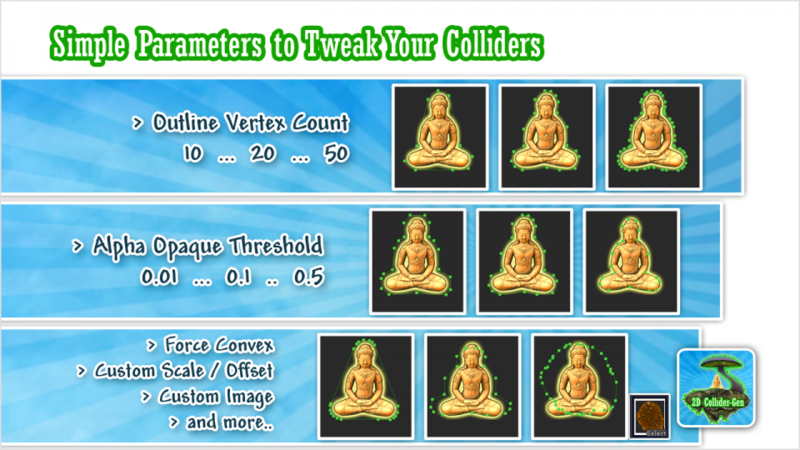 If that’s not an option, check “force convex” at the AlphaMeshCollider and tick “convex” at the MeshCollider component, then the front and back caps are added automatically. We are sorry to say that we don’t offer a solution for concave MeshCollider caps.